The concept of massive transfusion was developed to trigger clotting factor therapy for the treatment of coagulopathy due to dilution, after a certain number of units of packed red blood cells. It has been defined as the replacement of circulating volume or the transfusion of more than 6 or 10 units of packed red blood cells (PRBC) in the 24 hours after injury. Until recently there has been little consideration of the transfusion of clotting products. Given the recent identification of the early coagulopathy of trauma and the new therapeutic regimens for massive transfusion, there is therefore a need to re-examine the concept of massive transfusion. To determine if there is a clinically relevant definition of massive transfusion based on outcome. A retrospective multi centre registry analysis of the transfusion practices of five centres in Europe and North America was carried out. 5150 patients were studied. Data was collected on demographics, mechanism of injury, 24 hour PRBC requirement and mortality. 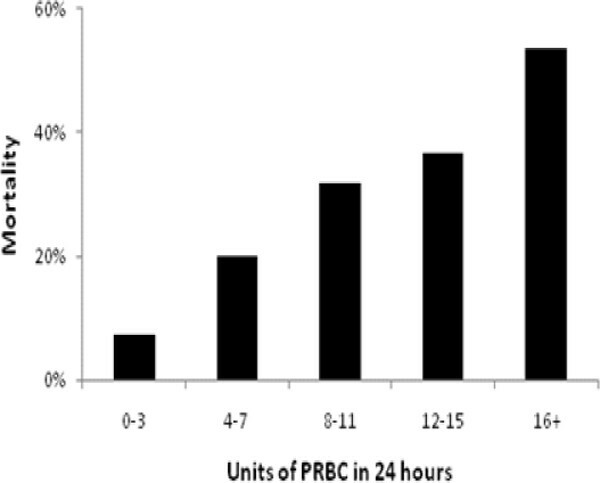 There was a linear increase in the number of PRBC transfused and mortality (Figure 1). No clear threshold above which mortality increased was found. 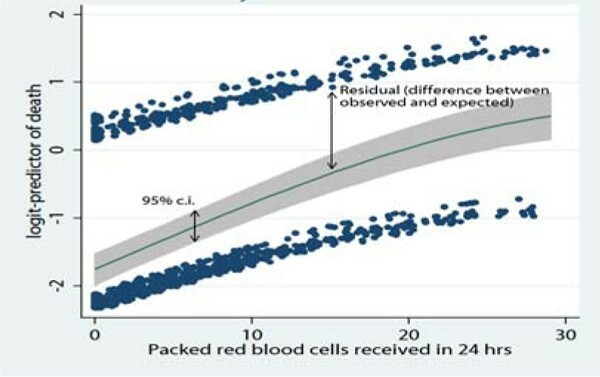 Each additional unit of blood transfused added cumulatively less to the mortality risk (Figure 2). The current definitions of massive transfusion are arbitrary and do not select patients on the basis of outcome. The differences in transfusion practices amongst centres around the world and the change in the treatment of the coagulopathy of trauma with PRBC and use of blood products in higher ratios may mean that massive transfusion has become an outdated concept.